Hydroseeding is quickly becoming the chosen method to establish a lush green lawn. You can trust Pacific Northwest Hydroseeding to get the job done for you. Our hydroseed application is guaranteed to perform and produce a full thick luxurious lawn of the highest quality. A written guarantee is provided with all our newly hydroseeded yards. Should portions of your yard wash out due to heavy rains or for some other reason, in certain areas, fail to perform to our standards, we will analyze the problem and re-spray, if necessary, at no charge to you. 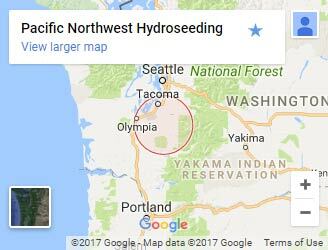 Pacific Northwest Hydroseeding provides the following cities and surrounding areas with hydroseeding. Call us at 253.848.2411 to see what we can do for you. The seed and mulch mixture is applied with a hose. It can be applied quickly across broad areas and varying terrains. The mulch is perfectly mixed and provides the optimal environment for grass seeds to grow. Not only are you saving on labor, the cost is significantly less than purchasing and laying sod. Hydroseeding is the best solution when considering cost effectiveness. Want more information about Hydroseeding and how Pacific Northwest Hydroseeding can get you started? Continue reading below! Are you ready for a green lawn? 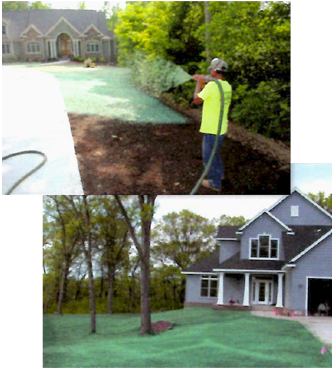 Try our hydroseeding! When you’re tired of having a dirt yard, there are few ways to get grass to grow. You can try hand seeding and do all the labor yourself, but it’s time-consuming work and many times isn’t successful. Sod is a viable option, but it’s definitely on the more expensive side. With sod, you have to pay for the loading, transport and delivery, and labor of putting it down. And even then it doesn’t always work! It might seem like it’s impossible to get grass growing quickly, inexpensively, and have it be high-quality. That’s where Pacific NW Hydroseeding comes in. 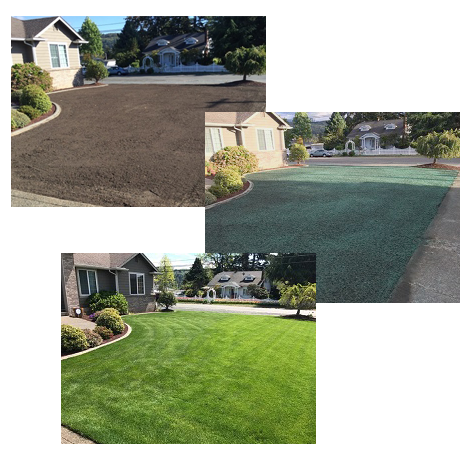 We do hydroseeding throughout Pierce County that can get grass growing in as soon as a week at half the price of laying sod! Hydroseeding is a relatively new way to seed a lawn. Developed in the mid-1950s, a mixture of mulch, water, and grass seed is combined into a slurry and carried by our hydroseeder truck. We drive the truck to your location and use a powerful pump and hose to spray the mixture onto your prepared land. The mixture prevents water and wind from eroding the seeds while also giving them the nutrients they need. This means the application is not only quick and easy, but has an extremely high success rate! How is your hydroseeding different from the rest? Using one kind of grass seed can make it prone to certain diseases or fail in certain soil types. We use a five seed mixture of three kinds of Perrenial Rye Turf, Chewing Fescue, and Red Fescue to make sure this doesn’t happen. Planting grass on hills and slopes is difficult with other methods. Our experienced hydroseeding crew can not only get you grass on the hills, but they are precise and avoid applying the mixture in places where you don’t want any grass. While hydroseeding is almost always effective, it’s not guaranteed to work. Unless you choose us! If you follow our lawn care instructions and the grass doesn’t work, we’ll come by and re-spray the region–at no cost to you! Want to know how much hydroseeding will cost at your property? Call us now to schedule a free estimate!